Loved using CEP entirely. Great service for an affordable price. Thank you so much. Love the exposure these paper cup coolers have. Truly satisfied with Custom Earth Promos. You guys are the best in the industry. Love the exposure these paper cup coolers have! Truly satisfied with Custom Earth Promos! It's a great marketing strategy for any event and plus all products are biodegradable! I really liked working with this company on several different occasions. They are always very attentive and responsive. Great idea for anyone serving coffee or beverages their a big hit at our shop. Love the product and service of Custom Earth Promos. We customized the seed paper cup coolers for our delicatessen. They really created great exposure for us. Great colors to choose from. The cup holders look great. We use these seed paper cup cooler at our coffee shop. They have really been intriguing to customers. Cool idea for our gourmet cafe. We try to maintain an organic lifestyle so these were a great addition. I customized my seed paper cup coolers for the office. They are just a nice added bonus. I choose to use the seed paper cup coolers as a marketing tool and it worked out great. A great way for us to add exposure to our small business and be eco-friendly. Im really impressed with that fact that these seed paper cup holders actually bloom. My staff really appreciated the seed paper cup coolers. They said that the bloomed flowers looked wonderful. I liked adding these seed paper cup coolers to our marketing campaign. Its nice to explain to customers how they help the environment in so many ways. I really like these seed paper cooler cups. They really contribute to our marketing plans. We have a food booth, and customized these seed paper cup coolers. It was a great way for us to gain exposure and help the environment as well. Customization on these seed paper cup coolers was simple. I made them for my catering business for an added promotion. A pleasure doing business with this company. Great recommendations and cost effectiveness. Superior customer service with this company. Looking forward to doing more business in the near future. Working with Custom Earth Promos is a joy. In the ultimate blend of style and sustainability, our Seed Paper Cup Coolers recycle into wildflower gardens after they've been used to carry a hot cup of coffee or tea. Custom Earth Promos prides itself on the knowledge that with a wide array of customization options, we are empowered to create 100% natural eco-friendly promotional products that pose no potential harm to the environment or your customers. 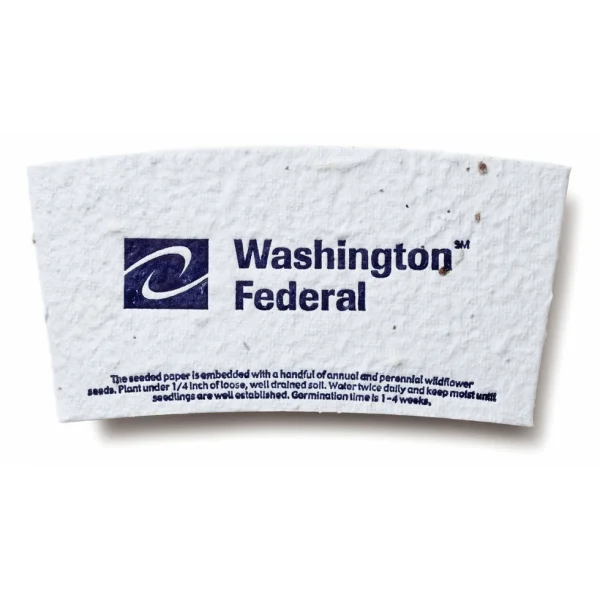 Establish your eco-responsible brand, increase word-of-mouth advertising and encourage brand loyalty by using seed paper cup holders to form a bond with your customers. 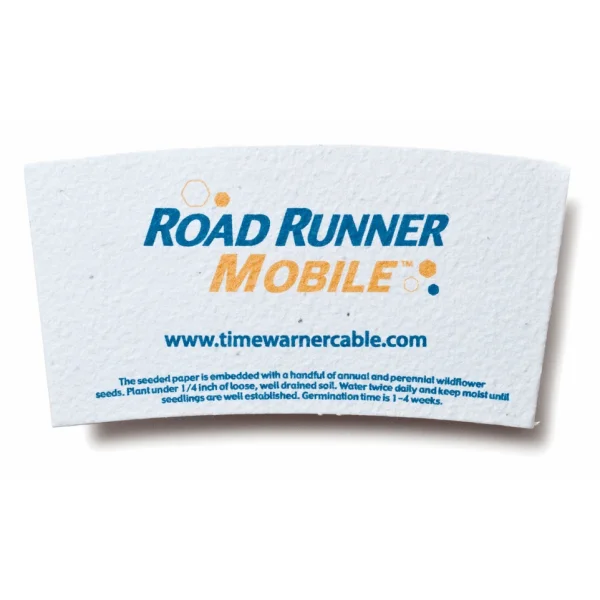 Use the available imprint space for your brand name, logo, and eco-friendly fact or initiative. When paper-embedded seeds are planted under 1/4" of soil and provided daily water, wildflowers begin to sprout in just 1-3 weeks. This garden will stand as a living, breathing testament of your message and eco-responsible business. Establish yourself as a leader in the "green" movement by inviting customers to join you in the fight for a sustainable future simply by planting their cup coolers. When gardens begin to flourish, customers will be reminded of your eco-ethical core and encouraged to continue taking their business to you. We are in a very delicate space where consumer activity is heavily weighed by the environmental responsibility of the brands they are purchasing from. The rate at which established "green" businesses are growing has reached an all-time high. With unprecedented return rates and growth of 300% since 2008, consumers and investors alike are acknowledging the need for green. Consumers are increasingly willing to pay a premium for products that have been responsibly sourced. According to a published report by the DuPont Corporation in 2010, 89% of customers surveyed agreed that delivering products with environmental benefits represents a long-term market opportunity. This "green opportunity" is a window for businesses that won't be open for long. There has been accelerated growth in the green sector for some time, making the challenge that much greater for delayed businesses to establish an eco-friendly image. Seize the day and establish your eco-friendly brand image as a leader in the sustainable movement with an exclusive design that captures your brand aesthetic or current campaign with every detail. Investing in renewable resources and sustainable strategies is a strategy yielding the strongest ROI in history. 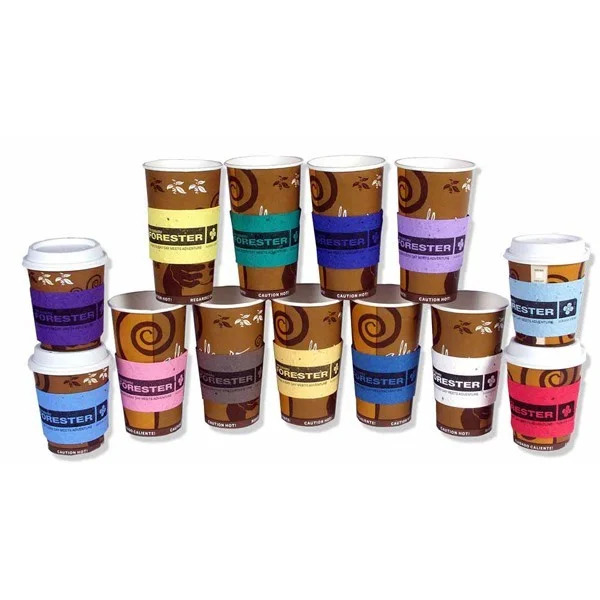 Businesses serving virtually any industry can launch a promotion to give customers a cup of hot Joe on their way out, publicizing an eco-responsible initiative and encouraging customers to "pay it forward" by planting their Seed Paper Cup Cooler. Choose from 21 vibrant shades for your seed paper color to complement your graphics. 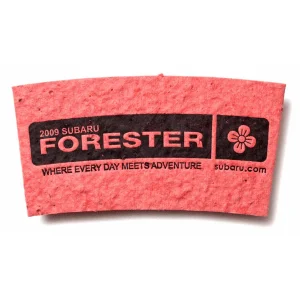 Customize seed paper to be rendered with a bold image of your name, company logo, and eco-friendly initiative. You'll work with a Custom Earth Promos team member to build an order blueprint from scratch that embodies every aspect of your message. We'll explore potential custom colors, graphic imprints and printing techniques. Customer Earth Promos' seed paper is the best in the industry, with the highest germination rates. Our seed paper is handmade in the USA from 100% post-consumer recycled material. Only USDA-approved, non-GMO seeds are used and the seed paper is produced at our 30 kW solar-powered facility. We carefully oversee every aspect of the manufacturing process and employ a proprietary printing technique to ensure maintained seed germination. All natural, soy-based pigments are used to color seed paper and render your Seed Paper Cup Coolers with custom graphics. Our vintage letterpress printing option stamps your logo directly onto the seed paper. The embossed image creates an attractive juxtaposition against the rich texture of our high-performance seed paper. Several other printing methods are available, depending on the design, quantity and time restraints of your order. Be sure to ask your design expert about the custom seed mixes available for your order!